There's been an undeniable NAS trend in the whisky industry over the past few years, with many distilleries increasing the range and volume of their NAS (or Non-Age Statement) whiskies. In some cases, we're seeing NAS releases replace their age-statement counterparts in certain markets (like Glenlivet's Founders Reserve, which has replaced the old-faithful 12yo in many markets), and in other cases, NAS releases are merely complimenting the standard age-statement lineup (like Laphroaig and their recent Select). NAS isn't a new thing, and nor is the debate that surrounds it. We first threw in our $0.02 back in February 2014, but NAS as a concept existed well before that. In 2013, Macallan unveiled a series of NAS whiskies which, in many markets (including Australia), is all that's readily available. We've seen other, more recent major NAS releases from The Macallan too, most notably the Edition No.1 and Rare Cask last year. 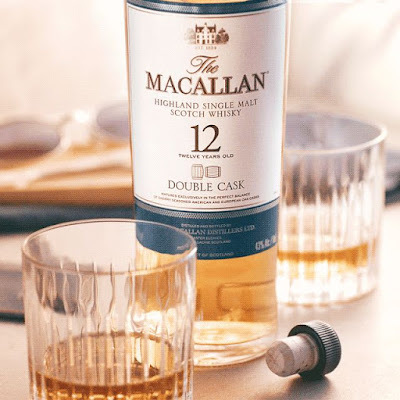 The Macallan Double Cask 12 year old is the distillery's latest release, and whilst it isn't yet available in Hong Kong, we were lucky enough to have a sneak preview recently. 12yo Fine Oak - matured in a mixture of American Oak Sherry casks, European Oak sherry casks, and American Oak bourbon casks. 12 year old Double Cask - matured in a mixture of American Oak Sherry casks and European Oak sherry, albeit with a higher proportion of American Oak sherry casks used than the traditional 12yo Sherry Oak (we're told it's very close to 50:50). So, on paper it sits between the existing 12 year olds...but does it in taste? The Macallan 12yo Double Cask (40% ABV, 12yo, Highlands, Scotland, yet to be released in HK or Australia. Pricing to match that of the 12yo Sherry Oak in HK - ~$580HKD). Nose: Distinctively (Sherried) Macallan, which for us means Christmas cake and dried fruits, but also flinty matchheads... however there's also honey here. It's lighter - noticably lighter on the nose than its Sherry Oak sibling. Finish: The sherry influence is there, but it doesn't dominate the finish. There's a floral, citrusy note at the end that we haven't seen on the more traditional sherried Macallans, but is evident on the Fine Oak 12. Rating (on my very non-scientific scale): 91/100. An enjoyable and very sippable dram - one that perfectly fills the gap between the 12yo Sherry and Fine oak bottlings. The Macallan 12yo Double Cask will be released in Hong Kong in the coming months. Thanks to Edrington HK for the recent preview. A little bit, yeah. A lovely dram, but if you like them a little stronger on the sherry side, you made the right choice. Is this a vatting or a double maturation? Vatting I believe - similar to Sherry Oak 12, but with less Euro and more American oak (all still ex-Sherry though).